So I’ve blogged about yule cat insurance before. 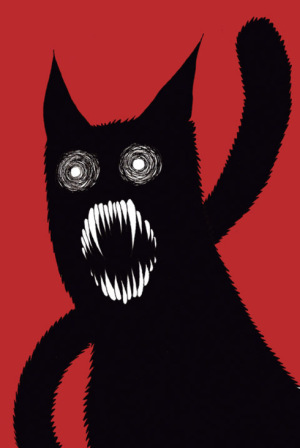 If you’ve just joined us, the Yule Cat [jólakötturinn] is a pretty formidable creature out of Icelandic mythology that eats people who have not received anything new for Christmas. That’s right: EATS those poor little innocents who are forced to go without. In other words, the Yule Cat is not some furry little kitty-cat you can cuddle with on the sofa. It’s a ravenous, hungry beast that will swallow you whole – UNLESS you get something new to wear at Christmas. And we’re not talking under the tree. That doesn’t count. It has to be before. This year, however, because of the kreppa and everything, both AAH and I decided to tone down our Yule Cat insurance requirements. I, for instance, dug out a perfectly good dress that’s still classic, performed a small alteration, added a new accessory, and VOILA! my new Christmas dress. No need to invest in something new. Same with AAH, who actually broached the subject all on her own a few days ago – a marked departure from the rather stringent demands of the 2007-era. If the truth be told, I had pretty much settled on being eaten by the Cat this year. Thought it might be kind of interesting, first time and everything. Make do with what I have, and all that. Check out the Belly, have a look around. BUT – at some subconscious level I felt decidedly uncomfortable with it. And it was at that point that I realized just to what extent I am influenced by the traditions that have been so ingrained in this culture for centuries. When I was small, great care was taken that I didn’t end in the belly of the Yule Cat, and now all these years later I simply cannot NOT buy myself something new for Christmas. And so, this year, as Yule Cat insurance, I have settled on a rather modest item: a sassy new red lipstick. I figure that will work. I mean – it’s new, and I intend to wear in on Christmas Eve. Granted, it’s not a piece of clothing, but it IS from MAC and it’s not tested on animals, so surely that holds some cred. Right? OK, here’s the deal. It was cold this morning. Cold and icy. So cold and icy that there was a terrible, horrible car accident on the road between Hafnarfjörður and Reykjavík in which two people were killed. EPI and I had a romantic getaway planned to Hótel Rangá this evening, to enjoy a Christmas buffet and spend the night. And you know what? We cancelled. Because of the icy roads. I have a bit of a car phobia as it is [several car accidents, two cases of whiplash] and there was no way I was going to undertake two hours of driving in those conditions, each way. Especially after that accident. Right now 2°C [36F] and the wind is picking up. Sunrise at 11.19, sunset at 3.28 pm. That is so true Alda, I too have been wondering what to do about the jóla kata dæmi… My sister saved the day and sent me pj’s from Aus – which I have now washed and will be able to wear to bed on Christmas Eve. As for what I will be wearing during the church and dinner section of the evening – I think I will be panic shopping in the only shop in town – at the last minute… but it is so ingrained… all good intentions get swept out the window just before the shops close. Hope you have a wonderful Christmas and thanks for all the posts during the last year – much appreciated.. have been able to direct people to you when they want an insight into what is happening on this rock that we call home. You know, I have that song on my iPod (thanks to you). I think the lipstick should be enough, really. Hopefully. my 84 year old mother has a little different view, you were subject to the ,cat, only if you did not receive a Christmas gift.AMMA made almost all of their clothes(a necessity,not subject to the ,cat,) however if after church,supper,and gift exchange on Christmas Eve,and you did not receive a gift(book,candle,etc.) you were subject to the ,cat,. Christmas Day was a time of family gathering , and if they were real lucky,AFI would be back from fishing,and would bring oranges and apples from England. Thanks for that Bjork song. Never heard it before now, but it’s splendid. The music feels a little like the opening titles of a late 70s childrens TV serial about the supernatural called THE MOON STALLION (also on YOUTUBE). It was composed by Howard Blake (who composed THE SNOWMAN). In Britland we’re all supposed to be under a blanket of snow this weekend, according to the weathermen, but it is icily cold rather than snowy. Alda, you’re quite right to be careful. We want to be reading your posts after the holidays, so take care! You have a Fierce Fashion Feline? I hope being an útlendingur leaves me safely outside its jurisdiction. I may get new clothing for Christmas, but certainly not before. The missus ‘saved my bacon’ by buying me some new socks.